At 27, Yuchun was a graduate student at Purdue University. But her life suddenly changed after she noticed bruising on her legs and was quickly diagnosed with acute leukemia. 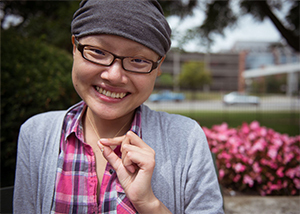 After several rounds of chemotherapy, she was referred to IU Health in Indianapolis for a life-saving bone marrow transplant. During her recovery, she stayed at Fair Haven for several weeks.